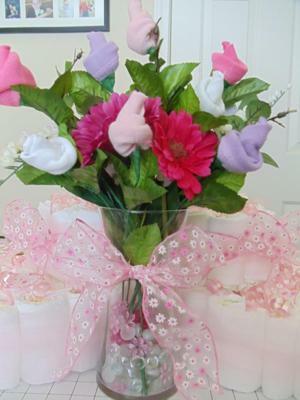 I love the combo of silk flowers and baby sock roses that Serree used making this sock rose bouquet. It turned out so pretty. 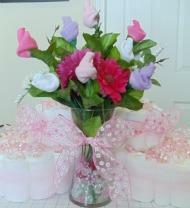 Serree also made an adorable baby bootie diaper cake to go along with it. Thanks for sharing your sock roses with us Serree! They are beautiful. 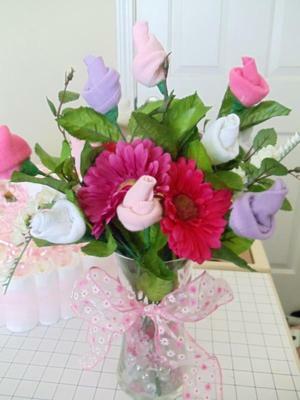 I used 6 pairs of baby socks for this bouquet. I rolled them up starting from the end of the sock up to cuff. Then I flipped the cuff over so that the sock looks like a blooming rose. I then used a two floral wire stems and twisted them together. Then I made a small loop at the top and wrapped the floral wire with floral green tape. I pushed the floral loop inside the sock and secured it with floral tape to make it look like a flower stem. The floral tape does not really stick well to the sock so I had to wrap it tightly and flatten it so it would stick. This part was the hardest to do while making them. Then I used left over rose silk leaves from a previous project and wrapped floral tape to secure them on the wire. I then added some silk Gerber flowers to add some depth and make them look more like a flower bouquet. I put them in a small vase, added some pink flower beads and gems to the bottom to help keep flowers put. Wrapped a wire ribbon to make a bow on the vase... There you go very simple and fun project. This was my first time making this. I think it came out pretty good. I will do this again for sure. Thank you for sharing the idea on the web site once again I was inspired to make this. I love the colors of your sock bouquet! They are so happy. I love that you used Gerbera flowers. They are my favorite. Great job! That is an adorable idea! You could probably also put t-shirts or other little clothing items on the flowers too.